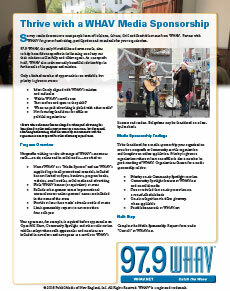 Click the image to learn more about partnering with WHAV. An informal survey demonstrates most people learn of local arts, culture, civic and charitable events from WHAV. Partner with WHAV for greater giving, participation and attendance for your organization. 97.9 WHAV, the only Haverhill-based news source, aims to help bona fide nonprofits in its listening area carry out their missions successfully and achieve their goals. As a nonprofit itself, WHAV also seeks mutually beneficial relationships in furtherance of its purpose and mission.